Never go out of style with these looks. Photo © David Alexander | Hair and styling by David Alexander | Click the photo for a larger view. I always enjoy working on Anthony -- he's got a great head of hair and is always willing to try something new. This is a tall flattop, tapered to a #1 blade on the sides and back, cut short at the crown with a smooth transition to a longer front. The nape is tapered tight and finished with a straight razor outline. I styled this haircut using Grant's Pomade. This haircut can be a fairly high maintenance haircut as it requires styling each morning and frequent trips to the barbershop to maintain the shape of the haircut. Ben's working an aggressively short pompadour haircut (or faded pompadour). For this style, we took the sides and to the skin using a 00000 blade (the tightest clipper blade available). The hair is cut to the skin about half way up the head and quickly faded into considerable length on top (about four inches). If the hair were combed straight down, there would be noticeable line of demarcation and much of the blending is achieved through styling. The hair was blown dry and styled with MENSDEPT. Microtech. Brandon's rocking what I will now officially call my signature cut... the short Ivy League (it's kinda "military rockabilly"). The sides and back are cut aggressively tight on the sides using an open clipper blade. Of course, the nape is finished with a clean taper and straight razor neck shave. The top is left longer (about three inches). Brandon's about nine and a half feet tall, so not having to cut too much on top is a plus because I really can't reach that high. For styling, we used Woody's Pomade to add control and shine. For this haircut, I asked, “so what are we going to do today?” His reply was, “whatever you think would look good.” I love it when a client says that. John has thick, dark hair — the kind that looks great with an aggressively tight taper. The thing I like about this type of haircut is the contrast you get between the scalp exposure on the sides and the longer length on top. The fade was done freehand with a 000 blade while the top was cut to about 3 inches long — you can really see the contrast between the fade and the longer top. We, of course, did a clean taper in back and finished the cut by detailing it with a straight razor. Styling was done with Woody’s Clay to give strong hold and shine. I really enjoy working on Kyle -- he's got a great head of hair and he's always open for suggestions. 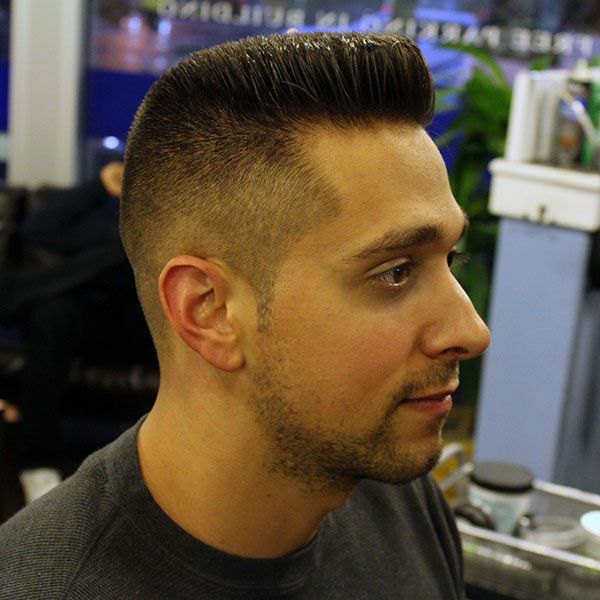 For this classic pompadour, we went tight on the sides and back (using a number 1 blade and a freehand technique). The hair is quickly tapered into significant length on top (combed down, the front would fall well below his eyebrows). Traditional pompadour styling was achieved by blow-drying the front up and back to add height and pomade was used for shine and control. I like this cut as it offers some styling options -- it can be worn as a pompadour (as shown) or parted to the side and worn down for a more conservative look. This haircut I did for Lucas is what I would call a depression era style haircut (or aggressively short pompadour). For this style, the hair is faded skin-tight low around the sides and back and quickly blends into considerable length on top (in Lucas’ case, about five inches). For this style, the blending really comes from styling. If you were to comb the style straight down, it would resemble a of a bowl cut. I really like the sharp contrast between the skin tight sides and the length on top. Pair this with some jeans, a white shirt, and skinny black tie and you’re golden. The downside to this style is that product is required to maintain styling and the style really cannot be worn down. I've been cutting Patrick’s hair since high school and it's been fun watching him grow into the handsome guy he's become. Of course he's got a great face, but he also has a great head of hair for this modified pompadour. We used a 000 blade on the sides and back and took it short high up the head, leaving a line of demarcation between the short sides and long top (the line disappears with styling). The top is about four inches long and styled with MENSDEPT. Microtech. Of course, realistically, with that face Patrick could wear just about any style and look great. This is the type of haircut you just can't go wrong with -- the style works for just about any face or lifestyle. For Paul's classic taper, we use a number two blade low around the sides and back (with a tapered neckline and straight razor detailing around the edges). The sides evenly blend into the longer top (about three inches long) with no visible lines of demarcation. This style is versatile in that it can be worn parted neatly with gel or pomade or worn loose and dry for a more casual look. This was the first time I’ve cut Seth Loeb’s hair — and I’m glad he came in. This classic pompadour looks great on him and works with his hip, retro sense of style. We clippereed the hair aggressively short on the sides and back with an emphasis on very clean lines around the ears and at the neck (finished with a straight razor, of course). The hair on top, which is about seven inches long, is styled back with MENSDEPT. Microtech (a little heat was applied to the front to give some added height).